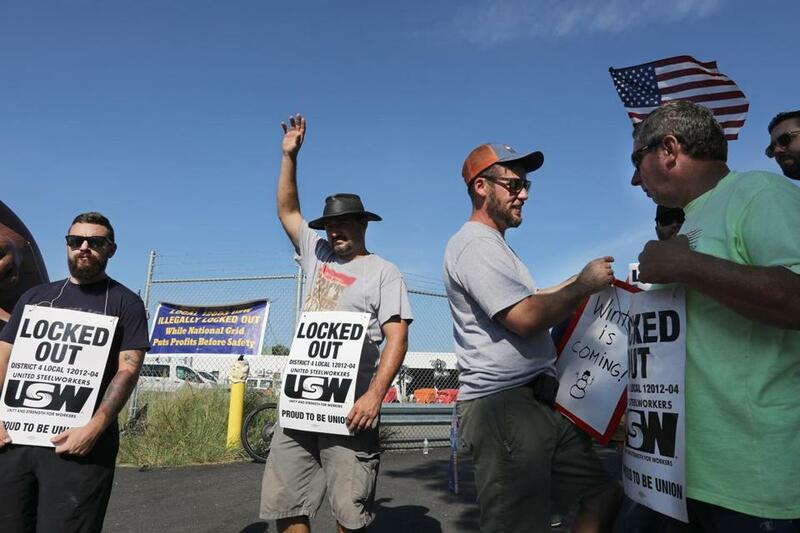 Locked-out union workers recently picketed outside the National Grid gas facility yard in Malden. 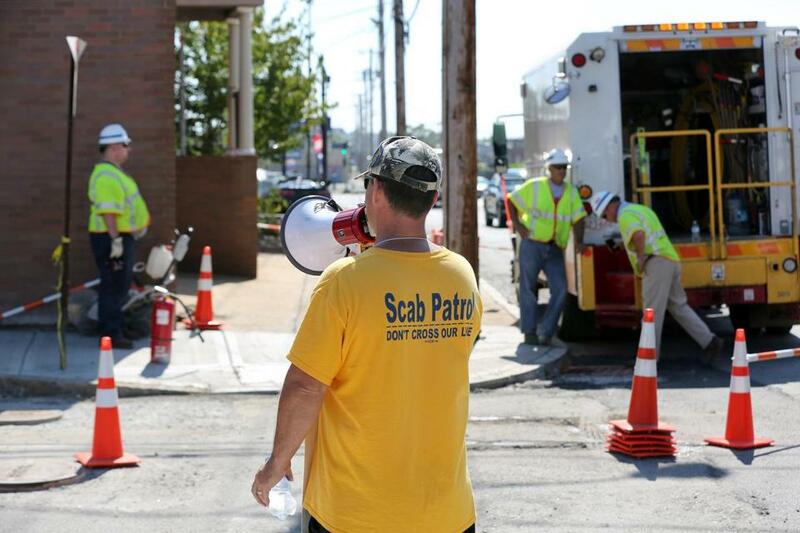 EVERETT — As a National Grid crew worked to fix a gas leak near the Silver Fox function hall on a steamy early September morning, more than a dozen union members stood across the street with picket signs, harassing the workers replacing them. Between taunts, Naumann, who said he has taken just three days off from picketing in the past 11 weeks, filmed the crew with his phone, zooming in on a replacement worker struggling to operate a saw. Before long, the work came to a halt as the crew waited for a backhoe to arrive. The picketers are among 1,250 United Steelworkers members who have been locked out by National Grid for nearly three months, with no end to a fierce contract dispute in sight. Every day, the locked-out workers are out picketing company facilities, holding demonstrations, heckling replacement workers, and documenting what they say are numerous safety violations by inexperienced contractors and supervisors now doing their jobs. The locked-out workers are getting unemployment, which pays them about half their base salary, capped at $769 a week, but have no health insurance. Fred Naumann taunted replacement workers in Everett. It is a fight that to some seems unwinnable — two union locals in Massachusetts taking on a multibillion-dollar British corporation — all to hold on to benefits that most workers no longer have. Unlike the majority of National Grid’s union gas and electric workers in the United States, who have accepted similar changes in recent years, Locals 12012 and 12003 didn’t agree to replace traditional pensions with 401(k)s for new hires or adopt a new health care plan that would raise costs substantially. In a time of waning union power and growing corporate strength, the unions say they are taking a stand not just for themselves, but for organized labor everywhere. Agreeing to a two-tiered system — one for new hires, one for veterans — would drive a wedge between workers, Local 12012 president John Buonopane said, dealing what could be a devastating blow to the union’s strength as new hires refuse to fight for benefits they don’t get. And the generous health care package — for everyone in the union — is justified given the dangerous work they do, Buonopane said. So the unions are holding their ground, using old-school hardball tactics, including an inflatable rat, to publicly pressure National Grid to bring them back. “It’s all we got,” said Naumann, 52. National Grid has said it is bargaining with the unions in good faith and holds its current workforce to the same standards it holds its union employees. The company said it also welcomes the unions flagging potential safety issues. “Even when things don’t actually turn out to be issues, it only demonstrates how much safety means to our union employees and we respect that because safety is part of our shared culture as a company,” spokeswoman Christine Milligan said in an e-mail. Buonopane often points out that this is not a battle the union started. Members were willing to keep working after the contract expired in late June, as they did two years ago. But this time, National Grid went on the offensive, locking them out the day after the contract was up — a move the union is challenging at the National Labor Relations Board. If the company were losing money (it reported a $4.8 billion after-tax profit in fiscal 2018), and if 95 percent of union members hadn’t voted against its offer — after the lockout began — the union would be more willing to grant concessions, Buonopane said. 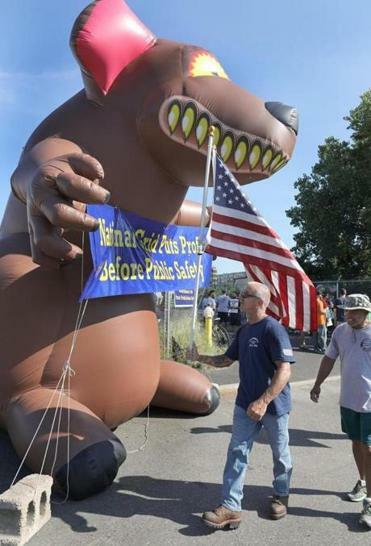 Union members are using old-school hardball tactics, including an inflatable rat, to pressure National Grid. He’s hoping the gas workers’ struggle will serve as an inspiration, like teacher strikes in West Virginia that spread around the country, or the Missouri residents who recently repealed the state’s right-to-work law, to encourage other workers to fight back. Beyond public protests, perhaps the biggest weapon the unions have is their expertise. Many locked-out National Grid workers have been on the job for 20 years or more. The outside contractors and supervisors who are replacing them undergo training but have far less experience in the field, according to the union, and the locked-out workers are monitoring their work, showing up to job sites with cellphones to document every false move. On several occasions, union members say they have stopped their replacements from doing something dangerous. They have watched workers drill over gas mains, they said, which could puncture the line; erect tents over gas leaks, which could spark an ignition; and use the wrong tools. One worker got in the back of a vacuum truck while it was still running, a potentially fatal move if the door closed on him, the union said, prompting an inquiry by the Occupational Safety and Health Administration. Last week, after being notified by the union, Medford Mayor Stephanie Burke sent a letter to the Department of Public Utilities, which regulates gas and other utility work, about a gas leak that went undetected for a week. Replacement workers used the wrong equipment, she wrote, and failed to take the proper readings before union workers detected a Grade 1 leak, the most dangerous kind, and called the fire department. “I am writing to express my serious fear of having any gas work performed by the replacement workers,” she wrote. National Grid said that it responds to all Grade 1 gas leaks immediately and works until the leak is repaired. Massachusetts is home to the one of the oldest gas distribution systems in the country, and its aging pipes are prone to leaks. In the first 10 weeks of the lockout alone, National Grid said, it repaired nearly 400 Grade 1 leaks. But a statewide project to replace aging gas mains with plastic pipes, in which National Grid has invested over $2 billion since 2010, has been put on hold in the 85 communities affected by the lockout. Over the course of the lockout, the unions have sent almost 100 alleged safety violations to the DPU and have been told only that the agency is looking into their complaints. DPU did not comment on the status of the reviews. Secretary of State William Galvin, fresh off a primary win, showed up alone in a rumpled gray suit as union leaders entered the DPU lobby. A few other politicians have also voiced their support for the locked-out workers, including Senators Elizabeth Warren and Edward Markey, and Boston Mayor Martin J. Walsh. After union members demonstrated for four Sundays at a park in Swampscott, the home of Charlie Baker, the governor is scheduled to sit down with the workers for the first time Tuesday. Local 12012 president John Buonopane said members were willing to keep stay on the job after the contract expired. So far, following union leaders’ appeals, at least 24 towns and cities, including Boston, have halted or called for a review of National Grid’s non-emergency work in their communities. The next meeting between the unions and the company is set for Thursday. As the work stoppage drags on, the stress and the relentless schedule — members have to sign up for several six-hour picketing shifts a week, and many do much more than that — are getting to people, union members admit. Some say it has caused problems at home. The two union presidents said no one is ready to give up, but they are well aware of the strain the lockout is putting on their members. 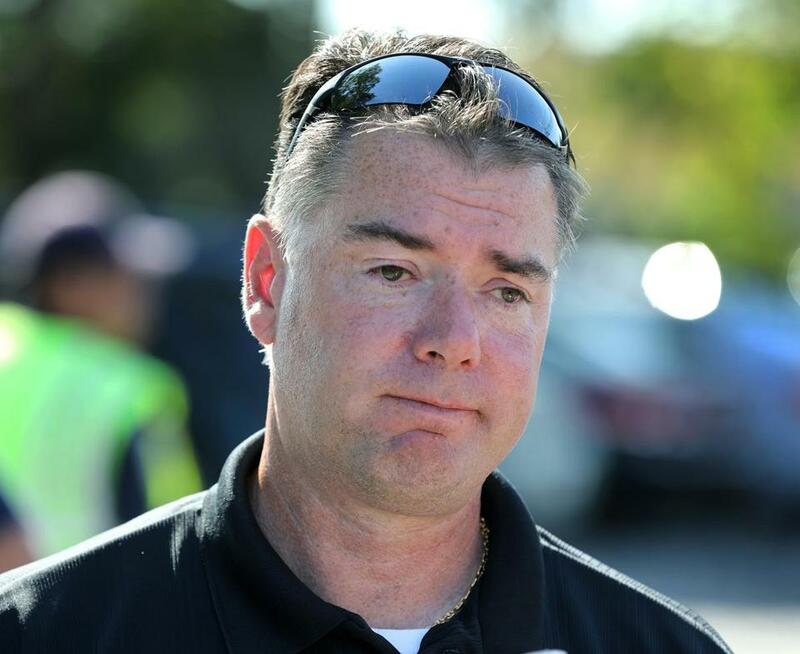 Buonopane, 51, the son of a baggage handler at Logan Airport who raised nine children on a union salary, started at Boston Gas, later bought by National Grid, as a 19-year-old meter reader. Buonopane still works in the field as a technician, and like his members, is going without pay, not even receiving his small union stipend despite the 60-plus hours he puts in every week. After the DPU rally, Buonopane went to Spaulding Rehabilitation Hospital to visit Bill Leccese, who has worked for the gas company for 48 years. Leccese, 71, had parts of his legs amputated several years ago due to complications from Type 1 diabetes, returning to work each time, but he has been out on disability since last fall with complications from congestive heart failure. An infection led to the rest of one of his legs being removed, a surgery he had to pay for with the union’s emergency fund while he waited for COBRA insurance and Medicare to kick in. Leccese, who has been in two explosions and a cave-in during his career, feels he has no choice but to retire. But he’s worried about his coworkers and is upset he isn’t out on the picket line with them.